For Dr. Croat’s complete CV with list of publications, click here (Adobe Acrobat Reader required). Selected Publications T.B. Croat. 2019. Les Araceae débarquent d’Amérique à la Médicée. La Médicée, 17 Mars, 2019. Croat,T.B. 2018. The Biological Bridge of the Americas A history of the Discovery of Its Plants. University of Panama 50 year PMA Lecture, 31 August 2018. Croat, T.B. 2018. The Philodendron Family (Araceae). 31st Annual John J. Dwyer Lecture in Biology, 27 April 2018, Missouri Bot. Gard., St. Louis, MO. T.B. Croat. 2017. Tropical rain forests-their complexities and their tragic demise. Lecture for The Holden Arboretum Scientist Lecture Series at the Cleveland Botanical Garden. Oct. 19, 2017. T.B. Croat. 2017. A Review of Studies with Araceae; Araceae of Central America. XIIth International Aroid Conference, Cali, Columbia, 06-10, July, 2017. T.B. Croat. 2017. Using Lucid Keys to discover New Species of Araceae. XII International Aroid Conference, Cali, Colombia 06-10, July 2017. T.B. Croat. 2017. Revision of Monstera of Central America. XIIth International Aroid Conference, Cali, Columbia, 06-10, July, 2017. T.B. Croat. 2017. Revision of Stenospermation Central America. XIIth International Aroid Conference, Cali, Columbia, 06-10, July, 2017. W.S. Yeng & A.W. Meeroow & T.B. Croat. 2016. Resurrection and New Species of the Neotropical Genus Adelonema (Araceae: Philodendron Clade). Systematic Botany (2016), 41(1) pp. 32-48. T.B. Croat & O.O. Ortiz. 2016. A Reappraisal of the Anthurium cuspidatum Masters Complex, section Polyneurium (Araceae). Aroideana Vol. 39 No. 2. T.B. Croat & L.P. Hannon. 2015. A Revision of the genus Chlorospatha (Araceae). Annals of the Missouri Botanical Garden. Volume 101, Number 1 2015, pp 1-259. O.O.Ortiz & R. M. Baldini & G. Berguido & T.B. Croat. 2016. New species of Anthurium (Araceae) from Chucantí Nature Reserve, eastern Panama. Phytotaxa 255 (1): 047-056. Magnolia Press. T.B. Croat. 2015. A Review of Studies of Neotropical Araceae. Aroideana. 38E: 44-54. T.B. Croat & G. Ferry. 2015. A Preliminary Analysis of Anthurium (Araceae) from Carchi Province, Ecuador. Aroidena Vol 38E: 1 88-93. Croat, T.B. 2014. Aroids of Colombia. Annual IAS Conference in Miami September 20th, 2014, Herbario Universidad de Antioquia, Medellín-Colombia. Croat, T.B. 2013. A Review of Black-spathed species of Anthurium. Presentation at 1st Colombian Aroid Conference -Ibague. T. Croat & G. Ferry. 2013. Anthurium of Carchi Province, Ecuador. XI International Aroid Conference, Hanoi, Vietnam 11-13 Dec. 2013. T. Croat. 2013. Aroid distribution in Colombia – the consequence of Climatic Change and Deforestation. 1st Colombia Aroid Conference, 10 August 2013. Croat, T.B. 2012. Research Program - SLF Version 3-29-2012. 30 March 2012. Missouri Bot. Gard., St. Louis, MO. Bogner J. & Croat T.B. 2012. A new species of Philodendron (Araceae). Willdenowia 42: 000–000. ISSN 0511-9618; BGBM Berlin-Dahlem. T.B. Croat. 2011. Araceae of the Guianas. Botany 2011. Healing the Planet, July 9-13, 2011. St. Louis, MO. T.B. Croat & P. Huang & J. Lake & C. Kostelac. 2010. Araceae of the Flora of Reserva La Planada, Narino Department, Colombia (Part 2). Aroideana, Vol 33: 75-141. T.B. Croat & P. Huang & J. Lake & C. Kostelac. 2009. Araceae of the Flora of Reserva La Planada, Narino Department, Colombia (Part 1). Aroideana, Vol 32: 30-122. M. Mora & R. Bernal & T.B. Croat & J. Jacome. 2006. A Phytogeographic Analysis of Araceae of Cabo Corrientes (Choco, Colombia) and Comparable Lowland Tropical America Floras. Ann. Missouri Bot Gard/ 93: 359-366. Croat, T. & Yu, G. 2006. Four new species of Philodendron (Araceae) from South America. Willdenowia 36: 885-894. ISSN 0511-9618; BGBM Berlin-Dahlem. T.B. Croat & A. Acebey. 2005. New Species of Araceae from Bolivia and Tropical Andes. Novon 15: 80C. T.B. Croat & J. Bogner. 2005. Xanthosoma feuersteiniae (Araceae), a new species from southeastern Ecuador. Willdenowia 35: 327-331. Zhu, G. & T.B. Croat. 2004. Revision of Dracontium (Araceae). Ann. Missouri Bot. Gard. 91: 593-667. T.B. Croat. 2004. Revision of Dieffenbachia (Araceae) of Mexico, Central America, and the West Indies. Ann. Missouri Bot. Gard. 91: 668-772. T.B. Croat & M. Carlsen. 2003. Flora del Bajio y de Regiones Adyacentes. Fasciculo 114: 1-35. T.B. Croat. 1997. A Revision of Philodendron Subgenus Philodendron (Araceae) for Mexico and Central America. Ann. Missouri Bot. Gard. 84: 311-704. Croat, T. 1994. The use of New World Araceae as drug plants. Japanese Journal of Botany 69: 185-203. Croat, T. 1992(1994). Taxonomic status of neotropical Araceae. Aroideana 13 (1-4): 44-3. 1990 . T.B. Croat. 1991. A Revision of Anthurium Section Pachyneurium (Araceae). Ann. Missouri Bot. Gard. 78: 539-855. T.B. Croat. 1988. Ecology and Life Forms of Araceae. Aroideana, Vol 11, No. 3 (4-56). Croat, T. & D. Mount. 1988. Araceae. Pp. 7-46 in Flora del Paraguay. Conservatoire et Jardin Botanique, Geneva & Missouri Bot. Gard. Croat, T. & N. Lambert. 1987. The Araceae of Venezuela. Aroideana 9: 3-214. Croat, T. 1986. The distribution of Anthurium (Araceae) in Mexico, Middle America and Panama. Selbyana 9: 94-99. Croat, T. 1986. A revision of the genus Anthurium (Araceae) of Mexico and Central America. Part 2: Panama. Monogr. in Syst. Bot., Missouri Bot. Gard. 14: 1-204. T.B. Croat & N. Lambert. 1986. The Araceae of Venezuela. Aroideana Vol 9, (1-4). 1986. T.B. Croat. 1983. A revision of the Genus Anthurium (Araceae) of Mexico and Central America. Part I: Mexico and Middle America. Annals of the Missouri Botanical Garden, Vol. 70, No. 2 (1983). pp. 211-416. R.D. Scheffer & T.B. Croat. 1983. Chromosome numbers in the Genus Anthurium (Araceae) II. Amer. J. Bot. 70(6): 858-871. Croat, T. 1981. A revision of Syngonium (Araceae) . Ann. Missouri Bot. Gard. 68: 565-651. 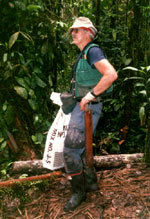 Click here to see a complete listing of Tom's publications.